February 3, 2016 at 11:06 a.m. Depending on where you look, this KU football class of 2016 is ranked somewhere between 80-100 nationally. Now before you throw your papers and spit out your coffee, you should remember that the class only has 17 signees in it and that hurts KU in these rankings. Even adding eight more two-star players would probably help KU jump 20-25 spots, so keep that in mind as you digest the class. Regardless of where they are and/or would be, I realize that KU’s current standing in the recruiting world is not a lot to brag about. And that only further hammers home the point that, given the state of Kansas football, getting this thing turned around is not going to be about the rankings and star ratings, it's going to be about coaching and development of the athletes KU is able to land. A couple of months ago, before well over half of this class had even been secured, KU coach David Beaty told me he felt good about the direction they were headed in with recruiting because the players they were in on were Big 12-caliber athletes. Now, KU didn't get them all and that does not mean that the ones they did get had other Big 12 schools on their lists (some did, some didn't). But I trust that Beaty and this staff know what Big 12 athletes look like and his words, based on that, sounded at least a little encouraging. Again, though, if these coaches don't develop the athletes they do get and coach effort and maximization of their potential, none of it will matter and KU will continue to occupy the Big 12 basement. That's why you've got to give them time, though. With that in mind, here’s a quick breakdown of the 2016 class. • Houston’s North Shore High linebacker Maciah Long. Long not only had the most big time programs after him, but he also is one of the best athletes in the class. Despite standing 6-foot-2, 240 pounds, the future KU linebacker led North Shore to a state title as the team’s quarterback. That speaks to his athleticism and ability to move and when you add that to his size and fearless nature, you’re looking at a guy who could have a very bright future in the KU program. The odds are good that he’ll get playing time right away and even better that he could be on his way to becoming a three-year starter in the middle of that Kansas defense. • DB Stephan Robinson — The coaching staff was very excited to get Robinson back in December, mostly because they see his D-I potential on the defensive side of the ball. An accomplished receiver throughout his high school and juco career, Robinson has the raw tools needed to play defensive back and already has some experience on defense. 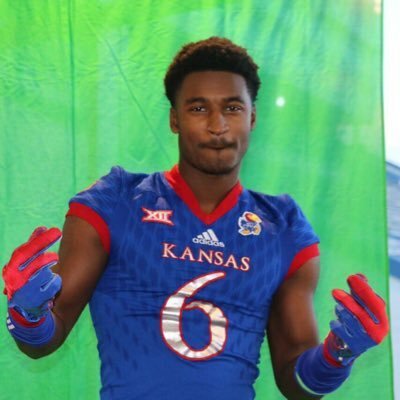 Given KU’s need for talent and depth at corner, Robinson will get a chance to play right away if he can pick up KU’s system and bring maximum effort. His arrival in time for spring football only increases his chances of making a splash. • It’s probably a coin flip between LB Maciah Long and CB Kyle Mayberry, with WR Evan Fairs right there. Because of the demands of playing linebacker against Big 12 offenses, I’d lean toward Mayberry or Fairs, with Mayberry having the slight edge simply because he plays at a position with far less depth. All three are talented players and I expect each of them to make an immediate impact while also upgrading the talent level at their positions over what KU was playing in 2015. 1. CB Kyle Mayberry – Extremely confident and very mature for his age, Mayberry also has the skills to back it up and should be a fixture at the corner position for years to come. 2. WR Evan Fairs – His frame alone (6-3, 182) will open your eyes and when you see him run, it won’t take you long to visualize him making big plays for the KU offense. 3. LB Maciah Long – With his combination of size, speed and tenacity, it’s going to be hard to keep this guy off the field, especially since he plays a position that already is pretty thin. 4. DB Stephan Robinson – At the very least figures to give KU quality depth at the corner spot. But given that he’s here in time for spring practices, working his way into a starting role is not out of the equation. 5. DT Isi Holani – Juco transfer from Riverside Community College arrived in time for spring practices and steps into a situation where KU needs bodies. The physical and explosive D-tackle is not only likely to play right away, but he also very easily could wind up starting. 1. DE Isaiah Bean – Undersized for now, Bean has the look of a player who, with 25-35 added pounds, could become a beast in a couple of years. He was KU’s answer to losing Lawrence High prospect Amani Bledsoe and even though he’s not physically ready to contribute the way Bledsoe would’ve been, he’s probably a better athlete overall and, like many players in this class, will be driven by the underrated/overlooked card. 2. OL Chris Hughes – The No. 2 rated player in this class, according to 247Sports, Hughes has a great pedigree, comes from a family of big time athletes and already at 6-4, 260, has the kind of frame that could add weight easily without impacting his athleticism. Ranked as the 68th best offensive tackle nationally, Hughes just missed cracking the Texas 100. 3. DB Ian Peterson – The 5-11, 175-pound cornerback ranked as the 152nd best player in Texas might not be ready right away, but his blend of top-end speed and extreme physicality make him a name to stash away in the back of your mind. If given a year to red-shirt and adjust to the college game while working in the weight room to add to his already impressive build, Peterson could emerge as a quality option at safety in the years to come. • I think KU did a fantastic job in the secondary, bringing in a handful of defensive backs who seem to be poised to play right away, with Mayberry and Robinson leading the charge. In terms of the future, KU did a nice job up front on the offensive line, adding three or four quality players who should be given the opportunity to red-shirt and develop, the way offensive linemen are supposed to. After years of being stacked at the running back position, KU is all of a sudden pretty thin in the backfield. Ke’aun Kinner is back and he performed well when he was healthy in 2015. Behind him, however, is a host of unproven players, including sophomores Taylor Martin and Ryan Schadler, who was used primarily as a kick returner last season. KU added Heritage High tailback Khalil Herbert in the class and he looks like a decent player, who certainly could develop, but KU remains thin at the position and could’ve used another back. The low number of available scholarships likely cost them the opportunity to add another alongside Herbert. • I’m going with New Orleans quarterback Tyriek Starks, who has good size (6-2, 188), is a great athlete and seems to be pretty underrated, with only Tulane and Georgia Southern going hard after him. KU got in on Starks late — when they were in the area recruiting some players from nearby powerhouse Neville High — but once they saw him, they went after him with the full-court press. David Beaty was one of the first to go down to see him and, just a few days later, Starks picked Kansas. He told me the other day that the system they ran at Warren Easton High in New Orleans was very similar to what KU runs under Beaty and OC Rob Likens and he absolutely looks the part of the type of QB KU is looking for. The funny thing about Starks that makes him fit this category even better was that KU was not even looking for a quarterback in this class, but simply could not pass him up when they found him. The extra benefit here is that, if for some reason Starks does not pan out at QB, he’s got the size and athleticism to be tried at a number of other positions and he said he would be willing to play wherever if it wasn’t working out at quarterback. But he’s a QB first and wants to give it all he’s got there before moving. • It’s early, and you can bet more are coming, but I’ll go with another QB here, Lake Dallas, Texas, prospect Dagan Haehn. If not for an injury the summer before his senior season, Haehn likely would’ve landed a scholarship offer to a Power 5 program. The injury cost him some exposure, but he was still able to turn in some solid stats during the second half of his senior season. He moves well, has a strong arm and is well versed in the type of offense KU wants to run. If he comes all the way back from that injury without losing speed and athleticism, he becomes a very intriguing prospect for down the road. I’ll give the KU coaching staff a C+ for this class and mostly because it only includes 17 players. Part of that was this staff’s fault, for counting eight players forward last year, but part of that was because they were trying to make up for the numbers crisis they stepped into. Numbers aside, Beaty and company addressed several needs with the group, added a bunch of versatile athletes with the potential to play multiple positions and also somehow found the room to take a couple of high-upside athletes such as Starks and Lawrence prospect Bryce Torneden, whom I’m absolutely convinced will be on KU’s two-deep depth chart by his red-shirt sophomore season at the latest. The three mid-year transfers all filled serious needs and the class includes a good mix of ready-made players and future projects, many of who should be given the necessary time to red-shirt, develop and contribute down the road in Year 2 or 3. As much as I love Kyle Mayberry and Stephen Robinson to start at DB and hog most of the minutes I think Ian Peterson will steal one of those guys minutes, and Ian will be thrown to the wolves early as a freshman, way more talented than Stephen and definitely up there talented wise with Kyle Mayberry..
Coach Beaty - please look west of Lawrence but still in Ks next year. Us alumni out west would love to see some of our young men on your roster. A good example of the type of player that would be great for our program is the Kochevar kid from Salina South. We unfortunately watched him sign with purple land. There is some D1 talent out here. It was very exciting to watch Jake Sharp play at KU a few years back. It takes time to reestablish the relationships with those coaches. Western Kansas is also where the majority of the walk ons are going to come from for KU. He did. He was the last one to send his letter but it still was sent before 8:00 a.m. Smooth sailing up there today. Pretty rare for national signing day. In the article it says this is a class of 17 players, but it only lists 16 below. One of those, Jacobs out of West Virginia is, I believe, a preferred walk-on. What am I missing? This might not be exactly right. If you click on the 2016 class it states there is a Cam Durley, who signed in 2015; however, he reclassified to 2016. I think technically he was already signed and doesn't reflect in the rankings as a 2016 member. Again I could be misunderstanding this, but that is what I see as the discrepancy. Jacobs is a walk on according to one of the other articles Matt posted and KU had 2 players commit in 2015 that had to wait until this year. Cam Durley and Shola Ayinde are the two 2015 recruits that got pushed back into 2016. Too bad Northern Iowa and Clemson both out recruited KU in Kansas. Clemson, ok -maybe, but Northern Iowa. If you don't believe me, ask Rivals. They just said so on 810 so it's not just my opinion. From what I understand it's about total points. 2 x 25 = 50 and 2.5 X 17 =42.5. Using a total point system is pointless for KU this year. Even if we would have had all 3 star players, potentially we would have barely beat out Northern Iowa. Plus how many times does it need to be stated that college football player start rankings are inaccurate in general? Star ratings may not be perfect indicators, but it's also not a coincidence that the teams that typically have the highest rated classes are alao the same teams on the short list of national title contenders most years. Do you also think it's a coincidence that KU has had among the worst recruiting class rankings among the P5 schools the past few years while also being one of the worst P5 programs in the country? Very good article! Thanks Matt! 2 big things about this class. It's obvious what the emphasis was this year with 13 of the 17 recruits either being linemen or DB's. It's also very obvious that Beaty's ties to Houston from his A&M and Rice days played a big role in this class with 7 of the 17 kids being from the Houston area. The success of this class is and KU in general us going to hinge on the ability to develop talent because KU is never going to be a program that reels in 4 and 5 star kids on a regular basis. "__ is never going to be a program that reels in 4 and 5 star kids on a regular basis." Weren't they saying things like that about BU & the Mississippi schools 5 - 10 years ago. Will it happen next year, or even by the time this class graduates? Probably not. Never, though, is way extreme, but that's the society we live in now. The K-State game is on ESPN2 not ESPNU. C'mon guys I rel on you to know which channel the game is on. Last season's team performance was somewhere between 100 and dead last (the ESPN bottom 10 had us as the 2nd worst team in D1). 80-100 sounds like an improvement. Based on this class, do you know the number of scholarship players that will be on the 2016 roster? Not yet, but it won't be much higher than it was this year... Maybe in the 68-70 range, max. Still a little bit of a hill to climb to get back to 85.